Preheat the oven to 200ºC/400ºF/gas 6. Zest and juice 2 of the lemons. In a food processor, whiz together the onion, garlic, all the parsley stalks and half the parsley leaves. When everything’s finely chopped, scoop into a bowl and add the couscous, 3 tablespoons of extra virgin olive oil and half of the lemon juice. Stir in the hot stock and season well. Stir again and leave to the side for a couple of minutes. The fish should pretty much all be prepared by your fishmonger. Make sure the sea bass fillets are halved and the skin of both the sea bass and the red mullet is slashed with a sharp knife. Chop a few of the parsley and mint leaves and stuff them into the slashes – this looks pretty, flavours the fish and helps to crisp up the skin. 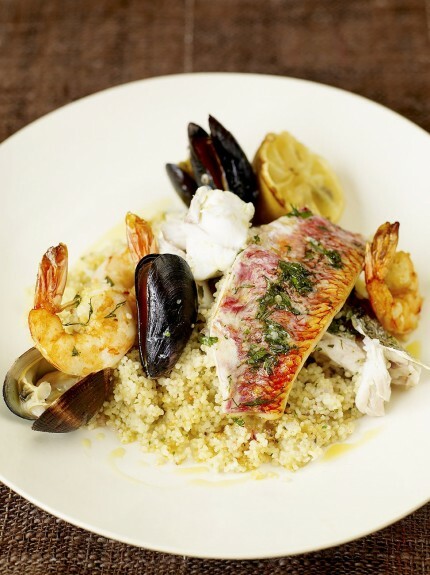 Place all the fish and shellfish into a bowl, drizzle over some extra virgin olive oil, season and mix together. Spoon the couscous into a roasting tray or ovenproof dish. Spread it out, then arrange the fish and shellfish over the top, in a single layer. Make sure the fillets are placed skin-side up. Drizzle over the remaining lemon juice, a little more olive oil and sprinkle with half of the lemon zest. Cut the remaining 2 lemons in half and put on top of the couscous. Place in the oven and roast for 15 to 20 minutes, or until the fish is cooked through and the skin of the fillets is crispy around the edges. While your fish is cooking, make the salsa. Finely chop the remaining parsley and mint leaves and put into a bowl. Add the cinnamon and remaining lemon zest. Finely chop the plum tomatoes and roasted peppers and add to the herb mixture. Season, stir and set aside. Once the fish is cooked, you are ready to serve. Make sure everyone gets a portion of couscous and a bit of all the different fish, and spoon over some salsa and garnish with the roasted lemon.